Peru is the nineteenth largest country in the world and is a diverse land, both in terms of people and geography. It is populated by over 29.2 million, largely descended from Spanish settlers, native Inca, and pre-Inca cultures. Peru has three national languages: Spanish, Aymara, and the native Quechua, reflecting the native Indian and Spanish roots that cultivated modern Peruvian society. Three distinct geographical terrains - coastal, sierra and tropical rain forest - give Peru a wide variety of both climatic and natural variation. Traditionally the Peruvian economy was based on natural resources such as mining, farming, fishing, and agriculture. Before the discovery of the Norte Chico, the Chavin culture was believed to be the first civilization in South America dating from 900 BCE to 200 BCE. The Ruins of Chavín de Huántar, located in the Andean highlands north of Lima are the most well-known archaeological evidence from the Chavin. The Chivan began the practice of camelid husbandry in South America through domestication of the llama. Many additional civilizations later existed in the Andes - the Mochica (100 CE - 750 CE) built the 41 metre stepped pyramid known as the Temple of the Sun at Moche. Contemporary to the Mohica was the Nazca, perhaps best known for being the creators of hundreds of large geoglyphs in the Nazca Desert visible only from the air. The Nazca also developed an impressive underground aqueduct system known as puquios which are still functioning to this day. The Wari Empire (500 CE - 900 CE) of south-central coastal Peru expanded through military means instead of religious and artistic influence as did previous cultures of the region. The Wari developed terraced agriculture and initiated major roadwork projects. In 1197, the Quechua speaking Incas establish their capital in Cuzco under Manco Capác.3 The area had been previously occupied by the Killke culture responsible for building the megalithic structure of Sacsayhuamán during the 12th century.4 The first ruler of the Inca established a code of laws and possibly abolished the practice of human sacrifice. It was traditional for the son of the ruler to lead the army. In 1463, Túpac Inca Yupanqui was appointed to lead the Inca army into neighbouring Chimor, a moon-worshipping culture descended from the Mochica. The Chimor were defeated in 1470. 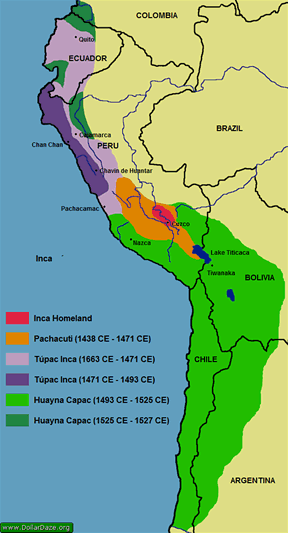 The conquest of their nearest rival solidified Inca dominance in the region. Túpac Inca Yupanqui became ruler in 1471 upon his father's death. His son Huayna Capac led successful campaigns in the south adding significant territory to the Empire. In 1493, Huayna Capac inherited the throne and began a series of campaigns to expand the northern frontier. At the height of its existence the Inca Empire was the largest indigenous civilization of the New World stretching some 4,000 kilometres along the high mountainous Andean range from Colombia to Chile, and extending from the western coast to the headwaters of the Amazon. It is estimated that at its height, the Inca Empire exceeded six million people from many different Andean cultures. The Inca expanded upon the existing roads creating a network measuring over 22,000 kilometres. One road ran nearly the entire length of the South American coast. However, all travel was conducted by foot as the wheel had not been invented. Like all previous Andean societies, Inca society was also based on agriculture, using developed techniques such as irrigation and terracing. Among the crops cultivated were maize, potato, squash, lima beans, chilli peppers, peanuts, cassava and quinoa.6 Camelid husbandry (llamas, alpacas and vicuña) and fishing were also vitally important. While the Inca developed a basic system of counting using bundled knotted strings known as quipu and an elaborate calendar, they did not use writing. Historical events were passed along through oral tradition. The Incas did not use money, instead they developed upon the system of barter whereby all citizens were required to labour for a set number of days per year known as mita. Gold ('Sweat of the Sun') and silver ('Tears of the Moon') were used only for aesthetical purposes to adorn temples and create artwork. In 1507, Spanish settlers on the Caribbean island of Hispaniola (shared by modern-day Haiti and the Dominican Republic) introduced small pox to the New World. By 1520, it had spread to the mainland. The disease devastated the native Amerindian populations. In 1527, small pox killed Huayna Capac, his successor, and most other Inca leaders.7 His death split the empire between two sons, Atahualpa who had control of the armies in the north, and his legitimate heir, Huáscar who was crowned in the Inca capital of Cuzco. Tensions escalated into civil war as the brothers fought for control of the Inca throne. From 1531 through 1532, their armies participated in numerous battles. Atahualpa defeated Huáscar's forces, but his victory was short-lived with the advent of Spanish conquistadors, led by Francisco Pizarro. In 1513, Francisco Pizarro accompanied Vasco Núñez de Balboa in crossing the Isthmus of Panama to become the first Europeans to view the Pacific coast of the New World. Pizarro launched several expeditions southward from Panama in search of a great land to the south rich with gold (thought to be the legendary El Dorado) known as "Pirú". In July 1529, Queen Isabel of Spain signed a charter allowing Pizarro to establish a viceroyalty in the region. Pizarro established San Miguel de Piura in July 1532 as the first Spanish settlement in Peru. Pizarro then led a small force of less than 200 men into Cajamarca to intercept the Inca ruler Atahualpa who had just defeated his brother and had been resting in the thermal baths in the Sierra of northern Peru known today as Baños del Inca. On November 16, 1532 Pizarro and his men captured the new Inca ruler and charged him with twelve crimes, the most important being attempting to revolt against the Spanish, practicing idolatry and murdering Huascar, his own brother. The Inca ruler attempted to buy his freedom by filling one room (7 meters by 5 meters to arm height) with an estimated eight tons of gold and another two similar rooms with silver. However, instead of satiating the Spaniards appetite for treasure, this tremendous act only confirmed the wealth of the Inca Empire. Atahualpa was executed on July 26, 1533. Spanish forces continued onwards and captured the Inca capital of Cuzco on November 15, 1533. On January 18, 1535 Pizarro founded the city of La Ciudad de los Reyes ("The City of Kings"), known today as Lima to serve as the Spanish capital of Peru. Against the Spanish steel swords, cannons and armoured mounted Conquistadores, the Inca clubs, bronze tipped spears and serrated wooden short swords were out-matched. Some parts of the Inca Empire revolted and joined the small number of Spanish forces thinking they would soon regain their freedom, not foreseeing the massive waves of Spanish immigrants that would soon be arriving. The Inca attempted on many occasions to regain their empire - including an unsuccessful ten month siege of Cuzco. For nearly four decades, successors to the Inca throne continued raids against the Spaniards and incited revolts. However, in 1572, the final Inca stronghold of Vilcabamba was discovered, and the last ruler, Túpac Amaru, was captured and executed, bringing the Inca Empire to an end. In addition to the military conflicts, epidemics continued to ravage the remains of the Inca Empire, including measles, pneumonic plague, typhus, influenza and diphtheria. In 1546, as much as two-thirds of the vitally important llamas and alpacas begin dying from carache (llama mange). These diseases further demoralized the Inca causing them to reject their gods and traditions as the recent European settlers showed relative immunity. Relatively few golden artifacts from the Inca Empire exist today as most were melted down and shipped back to Spain. Perhaps the most familiar symbol of the Inca Empire is Machu Picchu. The "Lost City of the Incas" was built around 1460 and later abandoned due to devastation of the populace from small pox a hundred years later. In the 18th Century, the area of the Viceroyalty of Peru was reduced from the creation of two new jurisdictions - New Granada (founded on May 27, 1717 consisting of much of north-western South America and parts of Central America) and Rio de La Plata (founded in April 1776 comprising of the area east of the Andes in southern South America). The newly freed nations of South America quickly turned on one another over numerous territorial disputes. Peruvian forces fought against Gran Colombia over border lands from 1828-9.10 The Chilean-Confederation War (1836-1839) between the Peru-Bolivian Confederation against the forces of Chile, Argentina, and Northern Peru ended with a Confederate defeat and the creation of Peru. The discovery of using guano as a high-nitrate source for explosives and fertilizer during the 1840's resulted in two wars - the Chincha Islands War against Spain (1864-1866) and the War of the Pacific (1879-1883). In 1863, Peru introduced the Soles de Oro (PEH) replacing the circulating Bolivian Peso at a rate of 1 PEH to 1.25 Bolivian Pesos. In 1930, Peru left the gold standard and established an official rate of 2.5 PEH = 1 USD which lasted until 1946. Over the next fifty-five years, the PEH was repeatedly pegged to the USD with a lower valuation. After 1975, multiple official exchange rates were often established within a single year. Beginning in 1979, larger demoninations of banknotes were issued by the Central Reserve Bank of Peru. These notes included the 10,000 Soles de Oro banknote, released in 1979, the 50,000 Soles de Oro banknote in 1982, and the 100,000 Soles de Oro banknote in 1985. By this time the exchange rate to the USD was 5,965.98 to 1. The chronic inflation of the PEH resulted in its replacement with the Peruvian Inti (PEI) named after the Inca sun god. On February 1, 1985 old soles notes could be exchanged for new inti banknotes at a rate of 1000 PEH to 1 PEI. The initial value of the new currency was 11.65 PEI to 1 USD. Coins denominated in the new currency were put into circulation starting in May 1985 and banknotes followed in June of that year. In 1986, the highest denomination was 1,000 intis. However in September 1988, amidst excessive printing of the currency by the government to fund expenditures (a practice known as seigniorage) monthly inflation soared to 132%. In August 1990, monthly inflation was 397%. At the end of that year, it took 516,989 PEI to purchase 1 USD. The highest denomination was 5,000,000 intis, released in 1991. After only six years of circulation, the Peruvian Intis was abolished. In the July 1, 1991 currency reform, 1 Peruvian Nuevo Sol (PEN) replaced 1,000,000 intis. Coins denominated in the new currency were introduced on October 1, 1991 and the first banknotes appeared on November 13, 1991. The Peruvian Nuevo Sol has been the most stable and reliable currency of the Latin-American region in recent years.